Summary: Vehicle fuel efficiency has not significantly increased since the 1980s. The current CAFE system puts the onus on automakers and therefore has been resisted (successfully) by the auto industry. A feebate program based on vehicle efficiency would nudge consumers toward efficient vehicles, creating a market demand for higher MPGe vehicles. Automakers will follow consumers and fulfill the market demand. Feebates mechanics are explained and a structure for one is purposed. Soon after Donald Trump became President-elect Trump, the automakers appealed to him and his transition team to ease fuel economy requirements. The current US regulations have a fleet average requirement of 54.5 MPG by 2025. This is known as the Corporate Average Fuel Economy (CAFE) standard. Most vehicles sold today are significantly below 54.5 MPG mark, so to meet this goal the automakers are forced to add more electric vehicles (EV) to their product offerings. These EVs would be used to offset the sales of their gas-guzzling SUVs and pickup trucks. The automakers argue that there is no demand for electric cars. They claim this makes it impossible for them to meet the CAFE goals. Perhaps a specious claim by the automakers, but they try to sell vehicles that are profitable and in-demand. So the incentive program's goal should be to create demand for efficient vehicles. A system that appeals to market incentives, rather than regulatory hurdles, is far more likely to be successful. The current system puts the burden on the automakers. This guarantees that they are going to fight against it (other than the few electric-only car companies). We need a better system than CAFE. The automakers are a politically powerful group. If you try to force their hand with regulations, you get what we have today, resistance and little to no change. We need a system that creates and encourages the uptake of high MPG and electric vehicles by consumers. If a significant number of customers are demanding efficient vehicles then the automakers will be racing to win that market, rather than fighting against the government policies and delaying progress. We need a system that encourages people to buy efficient vehicles, not one that punishes automakers for not selling them. The automakers that don't move to meet this demand will have sales shortfalls and will either adjust course or cease to exist. Companies understand and are willing to spend money on customer acquisition costs. This is very different than spending money on compliance; different in that it will actually receive internal funding. If there's a significant market demand for plug-in cars, automakers can spend their money designing vehicles to fill the need rather than paying lawyers to fight Washington D.C. So how could you encourage people to demand higher MPG vehicles? The simple answer is higher gasoline taxes/prices. This would be effective and it may have some place, but it is a regressive burden in that it punishes those who cannot afford to buy a new car and I cannot recommend it as a primary solution. I think the better answer is to modify the new vehicle purchase behaviors. I apologize in advance, this is going to be a bit of a wonk-walk. It is hard to discuss policy details without, well, getting into policy wonk details. If you want to make EVs and high mileage cars attractive, you have to make them affordable. Today, the average fuel economy for passenger vehicles on US roads is about 26 MPG. Efficiency ratings have stagnated in this zone since the 1980s and this is far below the EPA's Corporate Average Fuel Economy (CAFE) target of 54.5 MPG. A feebate system might help. The idea of a feebate is simple. There are fees on things that you want to discourage (low MPG vehicles in this case) and rebates on things that you want to encourage. This method is a nudge on the market forces. With this method, the government is not picking technology winners and losers. Instead, it is setting goals and leaving the door open to innovation and market forces to achieve or even exceed these goals. A feebate is a simple nudge; market forces take it from there. For this feebate thought experiment, let's say there is a tax on any passenger vehicle that's below the target (54.5 MPG). You can call it the energy security tax or gas guzzler tax. In this example, the amount of the tax is 0.1% (one tenth of one percent) for each 1 MPG that the vehicle is rated below the target. So an 18 MPG car would pay a 3.7% tax. The top selling cars (#10 - #4 on the list) would all have a fee of about 2.5%. The target of 54.5 MPG is an aggressive goal (as it should be). At 52 MPG, even a Toyota Prius would have a small fee of 0.3%. A target of 54.5 clearly encourages something beyond hybrid vehicles. The top 3 selling vehicles in the US (again according to Kelly's countdown) are all trucks. As top sellers, there are more of these on the roads than any of the above cars. However, since these trucks have a lower MPG rating than the above cars, they will pay about 1% more than the cars. 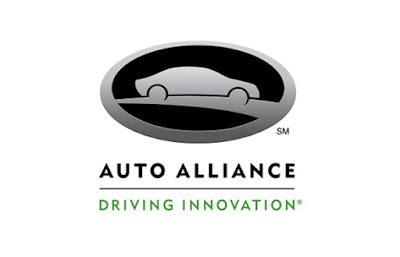 According to the WSJ, automakers sold 17.5 million cars and light trucks in the U.S. in 2015. In that year Americans spent about $570 billion on these new rides. If the above fee structure were in place for these sales, then about $15 billion would have been raised. The fees collected in this feebate program would be used as incentives (or rebates) for vehicles that get over 125% of the target, or 68 MPG. These vehicles could be battery electric, plug-in hybrid, fuel cell, compressed air, Thorium (j/k), or any new drivetrain or fuel system that could be imagined and designed to met the 125% (68 MPG) value and was safe for use on US roadways. We need a system that sets goals and lets innovation find the path. The amount of the rebate would be determined in such a way that it was revenue neutral with the fees collected. Today, with only one percent of new vehicle sales exceeding the 54.5MPG goal, there would be significant funds to pile on to those vehicles. From the fees above, this program would have ~$15B to spend on incentives. Looking at 2016 sales, about 150,000 plug-in vehicles (BEV & PHEV) were sold last year. Simply applying $15B to 150,000 cars would yield $100,000 rebate incentives available for each plug-in car sold. That is a crazy amount. It would be easy to sell plug-in cars if you could give away Teslas. As fun as that would be, it's not realistic. It does, however, give you an idea of how (especially early on) this method could jumpstart the market. So how could we really use the funds? The incentive should be a point-of-sale incentive. The system that we have in place today requires you to file your tax return before you see the incentive dollars. This means that it does not help reduce your car payment and, depending on that time of year you buy, it might be more than a year before you see the money back in your bank account. Most people cannot have $7500 missing from their bank account for months. The current federal EV incentive requires you to have a taxable income to receive the benefit. This is a problem because it excludes retirees. The workaround to the current system is to lease the vehicle (allowing the lessor to take the credit) and then the lessee buys out the lease. If the point of the program is to put efficient cars on the roadways, there is no reason to exclude retirees from the program (especially when there is a loophole). Keeping it simple and inclusive is a better method. The other reason to not have an income restriction on HEVI is that it is funded differently than the current program. The current federal program effectively allows you to take the incentive out of your own tax payment. If you owed the taxman $17,500 then you only have to pay $10,000. This feebate program, on the other hand, collects revenue from fees. So, on the rebate-side there is no need for an income requirement, just as there is no such income requirement on the fee-side. Similar to the case for including the retirees is the argument to keep high-income earners in the program. The air doesn't care about your income level. Another efficient vehicle on the road, regardless of who is behind the wheel, is a good thing. There's no reason to exclude retirees or the well-heeled, the point is to meet the goal and they can both help us get there. There is, however, an understandable concern that this program would be used to charge taxes to people buying Corollas, Civics, & CRVs to then use it to supplement people that are buying Teslas or plug-in Porsches. We'll limit this in the next section. There have been many incentive programs in various forms in various states and countries. There are two primary ways in which these programs can be abused: One, excessive payment for cheap vehicles making them free or nearly free and, two, excessive payment on very expensive vehicles that do little to advance the program's goals. Let's look at each case. If the program has a fixed dollar amount incentive (such as $10,000), then a very cheap vehicle that meets the stated requirements could be nearly or completely free. Some electric golf carts have taken (excessive) advantage of state EV incentives in the past that were written with sloppy requirements that unintentionally allowed them to be included. First, the policy rules need to restrict the incentives to only roadworthy, crash tested, vehicles. Second, the incentive would need to consider both the vehicle's cost and its contribution to the program's goals. This is handled via a restrict of the incentive to 30% of the vehicle's cost. By restricting the program to only pay for a percentage of the vehicle, this prevents excessive payment on any vehicle. Under this clause, if someone buys a $10,000 vehicle, they would only qualify for up to a $3,000 incentive. This program is not intended to 'give-away' vehicles, only to accelerate their adoption. An incentive that is too large creates a market bubble which will eventually burst and that is bad for long term growth. That concludes closing the low-priced loophole. On the end of the spectrum is the high-priced loophole. Just as the dollar based programs can be abused on the low-end, a purely percentage based program can be abused on the high-end. Here the abuse happens when the incentive structure pays someone buying an expensive car far more money than the car's contribution to the program's goals. Consider two cars, both have an EPA rating of 106MPGe. One costs $1M, the other costs $35,000. These two cars contribute equally to the program's goal, so they should be awarded equally based on their contribution, rather than based upon their price tag. Let's consider the million dollar supercar (which happens to meet the program goals). If this vehicle received a full 30% incentive, this would be an incentive payment of $300,000. This is a lot of money to reduce the emissions from just one vehicle; a vehicle which is likely to spend most of its life in a display garage. Let's put a reasonable maximum dollar limit of $10,000 here to prevent this excessive payment. The above two items, when taken together, start to define how the incentive should be structured. The incentive has to have a percentage restriction to prevent the free golf cart and it must have a dollar limit to prevent the supercar overpayment case. Let's use 30% and $10,000 for these values as we did in the above examples. Feebates can be structured with a hardline, with fees on one side and rebates on the other. Or they can be structured as three tiers. The lowest tier is the discouraged behaviors. This is where the fees are collected. Then there is an unaffected center zone (no fees or rebates). This is an area that does not significantly help nor detract from the goals. The final tier is the encouraged behavior. This is the zone that receives incentives. I find that two-tiered systems tend to make people do just enough to avoid the fee, but not much to pursue the incentive. The three-tier system has a middle tier where no incentives are paid. This allows the incentives to be bigger and more attractive in the third tier, thereby drawing people more toward the encouraged behavior end of the spectrum. In our example, the red zone is all vehicles below the target 54.5 MPG rating. The yellow zone is vehicles that are 100% to <125% of the target (54.5 to 68 MPG). The green zone is 125%+ of the target (69+ MPG). Further, the incentive in the green zone scales from the $5,000 at the bottom of the green zone to $10,000 at 150% of the target (82 MPG) and higher. This will be shown clearly in the vehicle chart below. This existing federal incentive has restrictions on the number of vehicles from each manufacturer that qualify for the incentive. Just as the existing program unnecessarily excludes retirees, here it will unnecessarily exclude the automakers that are doing the most to meet the goal. Again, the air does not care if this is the first high efficient vehicle from this manufacturer or the one millionth. Rather than restricting the incentive by automaker (as today's incentive does), the new program (HEVI) adjusts the fees, rebates, and targets annually to best meet the program's goals. Each year, the program would consider the balance of the funds brought in from fees and those spent on incentives. The fees, rebates, and targets would then be adjusted to keep the program revenue neutral. To avoid market swings, none of these should be changed by more than 10% in any year. In 2036, or whenever this program is no longer needed, it should have a slow fade out or sunset period where the fees are lowered 15% each year until they are zero. The incentives would follow the reduced funding and similarly be slowly reduced. Let's look at an example of HEVI applied to some upcoming high mileage vehicles. * This is not considering the retail price. The incentive cannot exceed 30%. The above list has some notable absentees such as Tesla and the Toyota Prius Prime. This may be because these vehicles are yet to be added as it is still early in the year. The top three selling vehicles of 2016 on Kelly's list were trucks. Not surprisingly, there were no trucks on the "Top Fuel Sippers" list. This means that under this feebate, nearly all trucks would be paying a fee. Note that I said nearly. There is at least one company making trucks that would qualify for the rebate portion of this program. That company is Via Motors. Via makes plug-in hybrid electric trucks. In practice, Via's trucks are not all that different from the Chevy Volt; they have a ~40-mile electric range, then a gas generator runs to keep the vehicle propelled. Having a built-in generator means that this truck can power work tools as well as haul them. Another company, Cincinnati-based Workhorse Inc., has begun development of a full-size plug-in electric pickup truck for delivery in 2018. The Workhorse vehicle is also planned to be a plug-in hybrid although with 80 miles of electric range before the range extender kicks in. Last on our plug-in truck list is Tesla. In the company’s Master Plan Part Deux the electric carmaker revealed plans to make a heavy-duty electric truck. There is no public production date yet for Tesla's truck so it is likely at least 3 years away. If these trucks come to market, their torque and towing performance will exceed anything currently in their class. Their uptake could be accelerated by the right incentives. Perhaps the $10,000 limit could be raised to $15,000 for trucks until this important market segment has developed. People don't buy new cars every year. If you want the fuel economy to improve quickly, you'll need methods to update the vehicles that are already on the road. These aftermarket kits that improve the fuel economy are called "upfit" kits. A Boston company called XL Hybrids installs hybrid kits onto existing truck and van fleet vehicles (class 2b vans up to class 6 trucks). The hybrid system improves fuel consumption by 20% and the upcoming plug-in hybrid will perform even better. How to fund and incentivize these kits is a topic for another day. Despite lofty goals, the average efficiency of cars and trucks on the roads today has not improved significantly since the 1980s. New technologies are emerging in plug-in hybrid and battery electric vehicles that promise to allow a leap in vehicle efficiency. As new technologies, it's not surprising that they initially have a higher price tag than the incumbents. A feebate program can both raise funds and encourage market forces to spur interest in higher efficiency products. This would allow the technologies to move through this early development stage and into mass market adoption. One year ago, I made my 2016 - 2019 plug-in vehicle projection for the US market. You can find it here. The simple trend line I used projected that 2016 would see 157,000 new plug-in cars on US roads when the ball dropped in Times Square. This projection turned out to be surprisingly accurate. I am happy to report that, according to the EDTA, there are now 157,112 more plug-in cars on the road. InsideEVs reports a slightly larger number of 159,139 sales. Either number represents successful growth of the US plug-in car market. These sales put a total of ~560,000 plug-in cars on US roads. This is on track to hit the 1 million mark near the time that we ring in 2019, as we predicted in the same article one year ago. Since the chart worked out well for 2016, I see no need to update it. At some point in time, the logistic function will take a steep upward turn and this linear trend will be woefully low. Based on current battery price trends, this is likely to occur between 2020 and 2025, so sticking with this simple trend line should continue to be an adequate estimate for the next couple years. Looking forward, this simple trend line predicts that we'll see ~180,000 new plug-in cars on US roads in 2017. During this year we should see the Chevy Bolt start selling in all 50 states. We should see 25,000 or more of them in the hands of new drivers. 2017 will also be the first full year of Prius Prime sales. This could put another 10,000 plug-in cars on the road or more (assuming dealerships will carry them). These two cars alone could account for the expected market growth over and above 2016. Several new EVs will make their premiere in 2017, but there's one in particular that we must discuss. The big wildcard of 2017 is the Tesla Model 3. Tesla has hundreds of thousands of worldwide pre-orders for the car, with about two hundred thousand of those in the US. This year, they could deliver just a few like the Model X did in its debut year of 2015, or they could deliver tens of thousands. Tesla has a track record of making sure that they're making their vehicles with as high of quality as they can before they start deliveries. They don't hold to previously announced product release dates if the vehicle is not ready. Their philosophy is that it's best for the company's reputation and long-term growth to deliver high-quality vehicles, rather than rush things to market. How this philosophy will affect the Model 3 is yet to be seen. But we do know that this vehicle will have a profound impact on the 2017 delivery results. 2017 should bring about 180,000 new plug-in cars to US roadways. The big wildcard is the Tesla Model 3. High volume deliveries could push that number over 200,000. Tesla represented about one-third of the plug-in sales volume of 2016. That is a lot from just one company. If they deliver the Model 3 in quantity, it will rock the market. 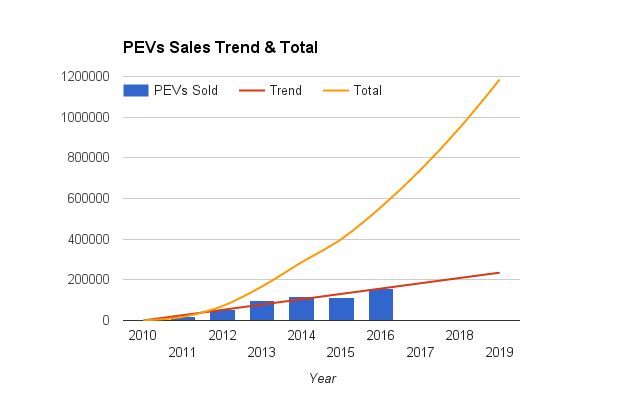 It would be very exciting if this estimate turns out to be too conservative and plug-in sales cross the 200,000 mark! Fingers crossed. How many Model 3 do you think Tesla will deliver in 2017? tl;dr: The ebb and flow of hydrogen fuel cells support by the US government, the auto industry, oil companies, consumers, and energy start-ups. A narrative of fuel cells from their modern birth in the 1960s til today and how battery electric car technology is accelerating and closing the market window for fuel cell passenger vehicle deployment. 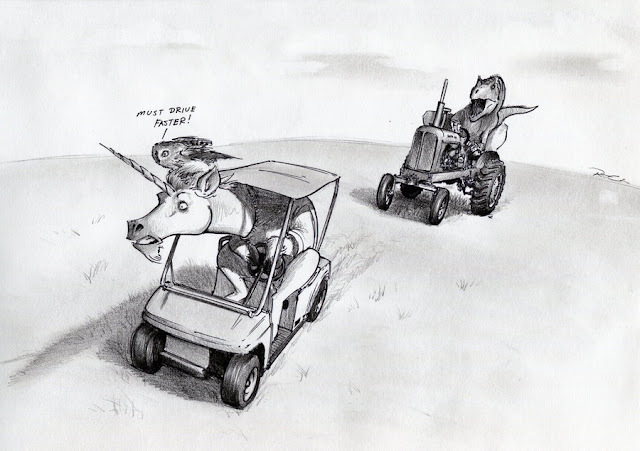 After writing a story about Centaur Driving, it seems appropriate to follow up with one about Chasing Unicorns. The case that fuel cell vehicles (FCVs) are a non-starter for passenger cars, goes something like this: the fuel is expensive, the infrastructure is very expensive, the vehicles are expensive, and there is no significant market interest. 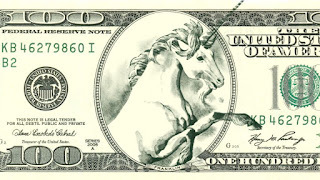 This list of seemingly insurmountable obstacles has led many to refer to FCVs as "Unicorns"; you can spend a lifetime pursuing them and have just as many as you started with, zero. 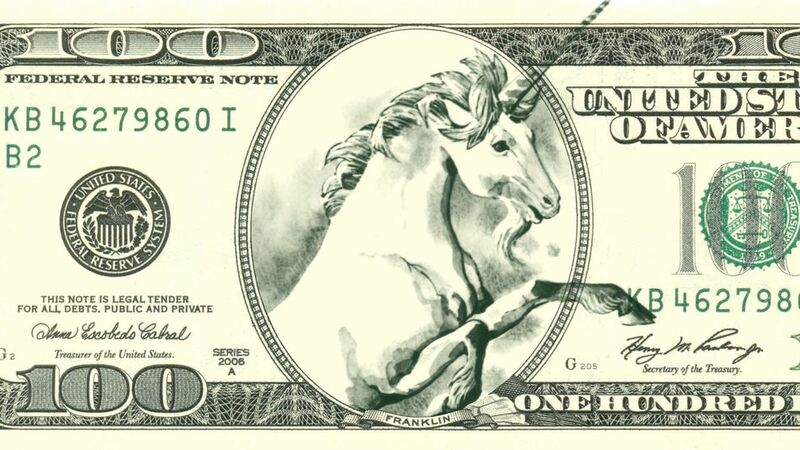 FCVs are, of course, not mythical unicorns; they do exist. To overcome these challenges it takes time, money, and engineering breakthroughs. This is the chase. The question is: is it worth it? Toyota has recently announced that they were appointing their president to lead their newly formed electric car division. They were one of the final holdouts for fuel cell vehicles. Government and industry support for FCVs has ebbed and flowed. Toyota is a major force in the alt-fuel vehicle market, this announcement could be the final harbinger signaling the sunset for the promise of a hydrogen future. Toyota turning away from fuel cell vehicles could be the swan song of the technology. There was a time when it was unclear if batteries or FCVs would be the right path forward for fuel-dot-next. In his book, Car Wars: The Rise, the Fall, and the Resurgence of the Electric Car author, John J. Fialka, makes a good case for fuel cell vehicles to be seriously considered in the 1960s. The performance of batteries at that time was far worse than it is today. Batteries were heavy and expensive. This meant that battery-powered vehicles in the 1960s were expensive and had a short range. This left automakers looking for another zero emission solution. The Space Race of the '60s was driving the development of fuel cell technology. Project Gemini and the Apollo Program both used fuel cells. In part, based on these advancements, in 1966, General Motors developed the first fuel cell road vehicle, the Chevrolet Electrovan. The path seemed clear, batteries were bulky, expensive, and slow to recharge; whereas, fuel cells allowed for fast refuel and the technology (although currently very expensive) was advancing quickly based on the space program's investments. Following GM's lead, other major automakers started fuel cell vehicle development programs. When fuel cell vehicle programs were started in the 1960s, they seemed like a good idea. Fast forward 30 years. In 1990, concerns about air quality and greenhouse gasses spurred California to initiate the Zero Emission Vehicle (ZEV) mandate. The mandate required 2% of all vehicles that would be sold in 1998 in California to be zero emission vehicles. The program was scheduled to expand to 5% of vehicles sales ZEV in 2001 and a required 10% ZEV in 2003. While emissions regulations and concerns had increased significantly during these 30 years, fuel cell technologies, on the other hand, had advanced at a glacial pace. The mandate forced the automakers to produce zero emission vehicles. Since fuel cells were not yet viable, this left no option for the automakers other than battery electric vehicles. General Motors again led the pack. They introduced the EV1. At its launch in 1996, it was the most advanced electric car in the world. The EV1 was a sleek two-seat coupe with very low drag and (according to its devoted drivers) had great power and acceleration. The original EV1 had 18.7 kWh of Lead-acid batteries with a 70 miles range. The later version of the car upgraded to (then cutting edge) Nickel-metal-hydride batteries with 26.7 kWh pack and 100 miles of range. This could have been the start of the electric car revolution, but that is not how things turned out. Instead, the electric car was killed. Who Killed The Electric Car? is a whodunit style murder-mystery documentary. It lists all the suspects and their means, motive, and opportunity in the death of the GM EV1 and its generation of 4-wheeled electric brethren. I won't give away the surprise, but that generation of EVs met their end. EVs were certainly technically possible at that time and the few people that were able to get behind the wheel of one overwhelmingly fell in love with them. They were, however, not profitable for automakers. The dealerships didn't like them because they didn't have much of a maintenance requirement and the auto manufacturers didn't like them because they had to share too much of the revenue with the battery manufacturers. Automakers wanted batteries to be a commodity item like door handles; they wanted to be able to outsource the production, package them in a car, and sell them with a large markup. That was not the case. From this perspective, batteries were not ready. When California started the ZEV program, fuel cells were not ready, but neither were batteries. The major auto companies sued California over the mandate and won. Post-lawsuit, ZEV became a toothless shadow of original bold self. This opened the door for hydrogen to step back into the limelight after the turn of the millennium. In 2003, President Bush committed $1.7 billion over 5 years to FCV development and infrastructure. The automakers responded to the incentives with a parade of proof-of-concept FCVs trotted out at auto shows for the next few years. Remember those fuel cells from the 1960s space race? In the 1990s, these designs become public domain. Ballard Power Systems took these designs as a starting point and began improving upon them and made multiple breakthroughs. The fuel cells of the 1960s required both pure Hydrogen and pure Oxygen. Ballard had figured out how to extract Oxygen from the air. This greatly reduced the fueling cost. This was not the only advancement Ballard made. They were a small company and didn't suffer from the not-invented-here institutional culture. They found new membranes that were developed for nuclear reactors and others developed for submarines. These, combined with their own innovations and dogged trial and error process, resulted in fuel cells that had significantly more power, lower cost, and they needed less Platinum. In the early 2000s, with government support, industry support, and technological advancement, it again looked like FCVs would again be the path forward. Fuel cells were only one piece of the puzzle needed for a Hydrogen future. Over the next few years, other challenges slowed the rollout of Hydrogen vehicles. The automakers had their proof of concept cars and they had deployment plans, but you cannot sell a car unless there's someplace to fill it up. 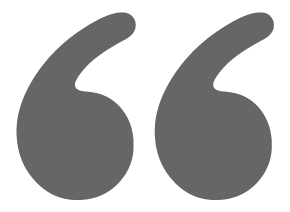 You cannot sell a car unless there is someplace to fill it up. The big oil companies had dipped into the available government hydrogen funds too and built a few hydrogen filling stations. These turned out to be very expensive. Hydrogen is a very difficult to store. This relegated FCVs to auto shows and small pilot projects near these few filling stations (primarily in California). An efficient and low-cost way to produce hydrogen. A safe, high-density method of storing hydrogen. A vast infrastructure for distributing hydrogen so that fuel-cell vehicles would have ample refueling options. Improved capacity of the fuel-cell systems themselves, which were not as durable, powerful, and low-cost as the internal combustion engine. Chu concluded that achieving all four big breakthroughs would be highly unlikely. “Saints only need three miracles,” he noted. After this scathing review of the state of hydrogen transportation by the chief of the U.S. Department of Energy, the department dramatically cut Hydrogen fuel cell projects. Funding was cut to nearly one-third of previous levels. For the rest of Chu’s tenure in the DOE, the department awarded very few new grants to develop the technology at universities, national labs, or private companies. In 2014, Chevron, Exxon, Shell, and BP all backed out of the Fuel Cell Partnership, a joint government-industry group that promotes hydrogen cars. In 2016, potential parts suppliers Samsung, Delphi, and Johnson Matthey exited FCV technology or severely downgrading their activity citing the tendency of car manufacturers and infrastructure installers to fund only token numbers of hydrogen refueling stations. Spending millions on research and development to then only sell a handful of parts is not good business. By 2014 the automakers had been working on FCVs since the 1960s in some cases and they had actually made progress. The vehicles had good range and performance, the fuel cells had longer life spans and lower costs (although still not cheap). But the cars were only one piece of the puzzle. Normally, car makers don't have to worry about fuel supplies or refueling infrastructure. No one working at the automakers today ever had to wonder if there were enough gas stations. That problem had been solved by a previous generation. When the obstacle of infrastructure seemed insurmountable (or at least not profitable), the infrastructure providers walked away. Many automakers, however, were unwilling to give up on their FCV programs. The EV1 was introduced in December of 1996. Twenty years later brings us to December of 2016. During these 20 years, driven by laptop computers, smartphones, and tablets, battery technology had continued to get better and cheaper every year. New chemistries were discovered, nanotechnologies were used, and several causes of battery degradation had been found and eliminated. The improvement rate of batteries was slow, only 5 to 8 percent each year. But these improvements compounded year over year. Even a small improvement rate, if sustained for decades, results in big improvements. No miracles required. In the 20 years since the EV1, batteries have gotten significantly better. I'd be remiss if I told this story without mentioning Tesla. In the mid-1990s, Martin Eberhard and Marc Tarpenning saw that battery technology was evolving quickly and created one of the first e-book readers to utilize this energy storage advancement. They sold this company for $187 million. Springboarding from this success, they starting looking for other things that could utilize these new high-tech batteries. This is what inspired them, with others, to start the electric car company that we know today as Tesla. Under Elon Musk's leadership, the company has been wildly successful at making award-winning high-end all-electric cars. The major automakers were free (at their peril) to dismiss Tesla as a niche player. That is until the Model 3 unveiling event forced the major automakers to reevaluate Tesla and EVs in general. 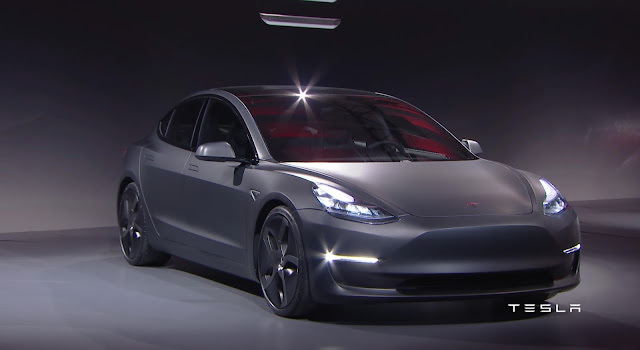 The Model 3 is Tesla's $35,000 car with 215+ miles of range and it is expected to start delivery in MY 2018. Model 3 launched like it was a new iPhone with frenzied fans. In March of 2016, people were lined up hours before the stores opened put down $1000 to reserve one. In that week of the reveal nearly 400,000 people had written a check to Tesla. This was the kind of product devotion that companies dream of having. It was a wake-up call to the auto industry. We started this story by talking about Toyota's about-face on electric vehicles. 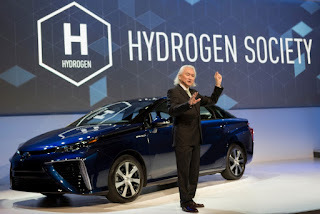 In 2015 and early 2016 they are trying to launch and sell a FCV, the Toyota Mirai. However, without the support of the oil companies to provide refueling infrastructure, the automaker could not create the market on their own (regardless of how great of a car they created). 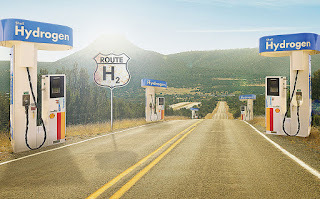 The Nikkei newspaper reported that "the lack of hydrogen fuelling stations poses a major hurdle for mass [FCV] consumption." After years of working on fuel cells and claiming that EVs will only be useful for urban runabouts, the evidence had piled up and they changed direction. The saving-face move is that Toyota has claimed to have made a battery breakthrough that will allow for better battery lifespan. I hope they have. To understand how big of a direction change this is for Toyota, see our recent story. Leaders in one generation of technology are often laggards in the next. Toyota is coming later to the battery electric vehicle game than others, but EVs are still only about 1% of the market. So Toyota will be in the game before the hockey stick makes its sharp rise. Many of the legions of Toyota fans that are driving Priuses (Prii) today will be happy to drive a Toyota EV in 2020. Above, we discussed Who Killed The Electric Car?, this might cause you to ask, "Who killed the FCV?" but they are not dead. The tide has turned and support has ebbed here in the US, but Germany or Japan or another country will continue to support H2 transportation. This will keep the programs funded, if only on life support. 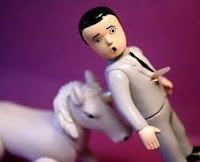 Perhaps the incoming US administration will throw another billion or two towards unicorn chasing. While I don't expect to see new FCVs at the 2017 auto shows, they could be back on display in 2020. We shall see. The dream of a Hydrogen Society is still a mirage on the horizon. The "miracles" that Chu mentioned are no closer to reality. Meanwhile, batteries have redoubled their performance several times over and show no signs of slowing this progress. BWM recently predicted that after one more doubling (about 7 years), battery electric cars will be price competitive with gas cars. If BMW is correct, this will put the tipping-point in about 2024. This will be when electric cars are just as profitable (if not more so) as gas cars for the automakers to produce. When this happens, automakers will put the pedal to the metal, or (if I may) automakers will get charged up and finally see the positive end of the battery. This will relegate FCVs to niche markets such as long-haul trucks or buses and even those may not be safe for long.